After being sent into bat by MI skipper Rohit Sharma, Bangalore started badly as they lost Virat Kohli cheaply to Jason Behrendorff. AB de Villiers was circumspect at the beginning of his innings, and it fell to Parthiv Patel to give some momentum in the powerplay. The southpaw made 28 and was particularly harsh on Behrendorff before he spooned an easy catch to point off the bowling of Hardik Pandya. 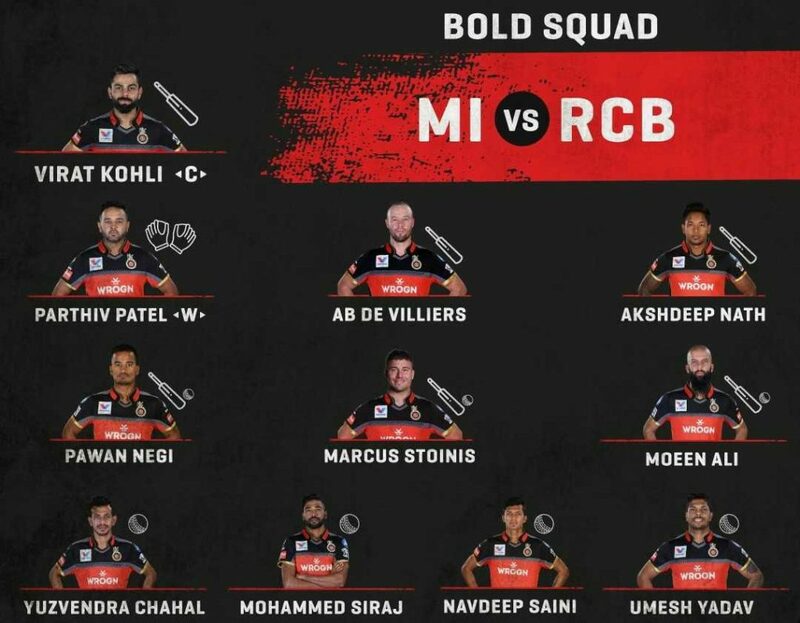 RCB sent in Moeen Ali ahead of Marcus Stoinis, presumably with one eye on ensuring that Krunal Pandya, who has a fantastic record against AB, didn’t bowl to the South African. Ali was fantastic and his quickfire innings allowed De Villiers to get going as well. He eventually fell for 50, holing out to Pandya at deep mid wicket for a 32 ball half century. Stoinis fell in the same over for a duck, unable to read Malinga’s slower one, as Sharma took an easy catch at cover. At the other end, De Villiers had no problems reading Malinga, dispatching him for two huge sixes, including one trademark outrageous lap hit over fine leg. However a poor individual piece of play from Akshdeep Nath, who refused to go for a second, saw De Villiers run out at a crucial stage of the innings by Kieran Pollard. Malinga’s wiles were too good for the remaining batsmen- he got Nath and Pawan Negi almost immediately after as Bangalore limped to 171/7, perhaps 10 or 15 short of what they might have achieved had De Villiers stayed on till the end. Malinga was Mumbai Indians’ best bowler as he claimed figures of 4/31 on his return to the starting XI. Chasing a target of 172, the Mumbai Indians opening pair of Quinton De Kock and skipper Rohit Sharma got their team off to a flying start, blitzing their way through the powerplay. RCB introduced spin and Chahal and Moeen brought their side back into the game with some clever bowling. Ali accounted for Sharma and De Kock in the same over, while Chahal picked up the wickets of Suryakumar Yadav and Ishan Kishan. Krunal Pandya’s slow innings (11 off 21) pushed the run rate to over 10 an over, and when he was dismissed in the 18th over, Mumbai needed 22 off the final two. Presumably under the instructions of bowling coach Ashish Nehra, Kohli gave the penultimate over to Pawan Negi instead of pacer Navdeep Saini. Negi’s first ball was a good one, but Pandya, known to be good against spin, took full toll in the remaining deliveries, hitting him for two sixes and two fours to finish the game with 6 balls to spare. Yuzvendra Chahal and Moeen Ali bagged 2 wickets each, while Siraj claimed one wicket. Lasith Malinga was declared the Man of the Match for his brilliant spell. The 32nd match of the Indian Premier League will be played between Kings XI Punjab and Rajasthan Royals at Chandigarh on Tuesday April 16.